Want it delivered, Friday 26th, April? Order in and choose Next Day Delivery at checkout. Or Free Standard Delivery on orders over £30. Triplus colour fibre tipped pens have an ergonomic triangular shape for relaxed and easy writing, drawing and colouring, without the fatigue feeling. The pen is dry safe which means it can be left uncapped for days without drying up, allowing you to switch between colours with ease without the need of replacing the cap. The water-based ink washes out of many textiles in case of any mishaps, the pressure resistant tip can withstand continuous colouring on paper and a line width of approximately 1.0mm. Ideal for writing, colouring, card crafting and much more. A bit about the brand: Step in the world of Inspriations! Staedtler is a German fine writing instruments company and a manufacturer and suppliers of writing, artist, and engineering drawing products. 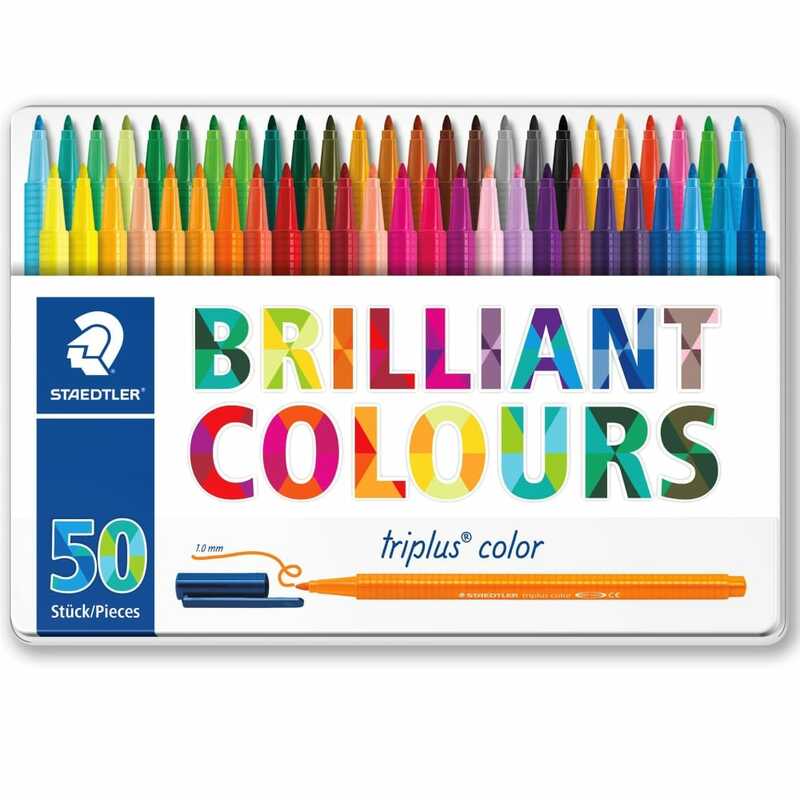 Showing 2 Staedtler Brilliant Colours Triplus Fibre Tip Pens Tin of 50 reviews. Average rating of Excellent. Would you like to write a review? A beautiful spectrum of colours, presesented in a tin. Lovely pens for colouring. These fibre tip markers are brilliant colours, easy to use with water on Watercolour paper or stand alone, I’m going to have some fun with these! !